Terrorists from Hamas-controlled Gaza fired a Grad rocket at southern Israel on Thursday evening. The rocket exploded in an open area of the Eshkol Regional Council. There were no physical injuries or damages. The attack was the third time in the day that terrorists fired rockets at Israel. 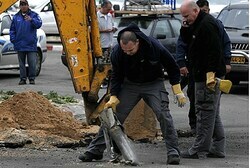 Earlier Thursday evening, Gaza terrorists fired a rocket at the city of Ashkelon. It exploded in an open area south of the city. No one was hurt. On Thursday afternoon, a Color Red siren sounded in the Hof Ashkelon Regional Council following rocket fire at the region. Last Thursday evening, a rocket attack from Gaza targeted the city of Netivot, the first time since Israel’s counterterrorism Operation Pillar of Defense in 2012 that a Gaza rocket struck near the city. Israeli Air Force (IAF) aircraft retaliated by targeting several terror-related sites, including a weapons facility and a terrorist center in northern Gaza, as well as a weapons storage site in southern Gaza.